TIME TO SERVE AT YOUR HIGHEST LEVEL AND SCALE YOUR BUSINESS TO MULTIPLE 6-FIGURES AND BEYOND? IT`S TIME FOR ENERGETIC SELLING METHOD™! 4-PART TRAINING WHERE YOU WILL LEARN HOW TO CREATE AND SELL 10K+ OFFERINGS YOUR CLIENTS WILL LOVE! I see you, Gorgeous. You've been working on your business long enough to know that you love, love, love what you do. You love your clients, you love the growth and transformations your work creates, you love the potential of your business. If only you knew how to reach it. Because that 'ceiling' you hit seems oh-so-real. (It's not like you haven’t tried!) And you're ever so hungry to break through it, scale your business to multiple six or seven figures and make an EXTRAORDINARY impact on the world, and your life with it. But there are things you're NOT willing to give up in order to make it happen; you're NOT willing to work like a dog to grow your business. Been there, done that. Not for you. You're also not willing to be out of integrity. "Hunting for clients" and pushing your services down someone's throat is simply not who you are. AND THAT IS WHERE THE ENERGETIC SELLING METHOD™​ COMES IN. It's a NEW way of growing your business exponentially while creating MORE time, freedom, love and connection in your life. Create an additional 60K in annual income in two weeks by following a single inspired idea. Sell out high-end retreats on the back of a single Facebook post. Triple your multiple-six figure business in less than six months and create a seven figure business that changes many live. Experience five-figure and multiple five-figure days again and again. Double, triple and quadruple your 1-2-1 coaching and group programs and sell them out with ease. In this 4-part training, I'll introduce you to the principles of the Energetic Selling Method™ and how to use it to create, market and sell 10K+ offerings. In other words, you'll be invited to allow yourself to serve at your highest level and to become your highest level. Will have no other choice but to reflect that in the form of extraordinary growth. ​HOW ARE WE GOING TO MAKE IT HAPPEN? 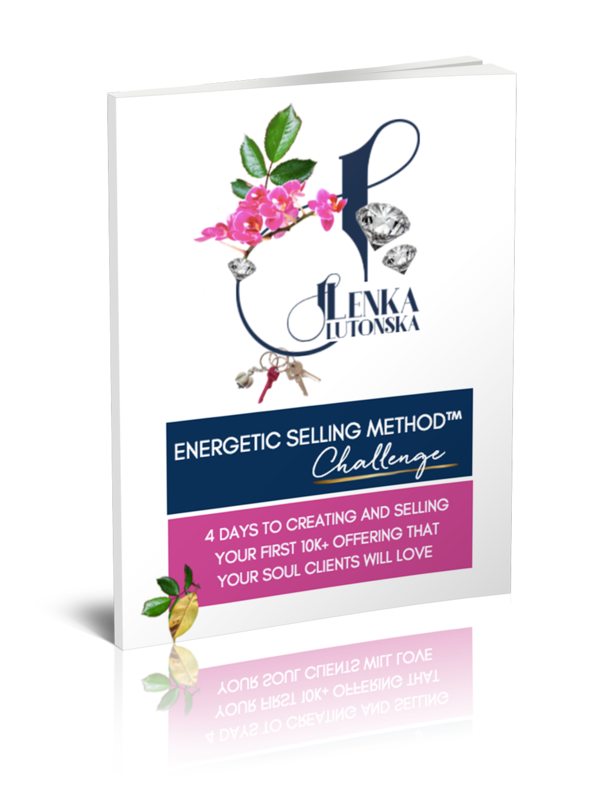 There are 4 Energetic Selling Method™ masterclasses. You will also get ESM™ Challenge Playsheets that will help you to integrate what you have learned. On Day 1, we will go into the nitty-gritty of creating 10K+ offerings that your clients will love. Whether that’s a group program, 1-2-1 coaching, a VIP retreat or something else, we will make sure your offering will be highly marketable and a perfect reflection of your soul. On Day 2, you will dive into energetic marketing - how to make sure you attract clients who can not only afford your high-end fees but will also gladly pay in full and allow you to do stay in your zone of genius while huge client transformations happen. You’ll also learn how to eliminate common objections (such as “I can’t afford it” or “I’ll have to think about it”) from your experience where your next level lives. Steam won’t form before water reaches 100 C. That’s where steam lives. Ice won’t form before water drops to 0 C. That’s where ice lives. A stream of perfect-for-you clients and selling your 10K+ offerings with the ease and clarity needed to make it happen won’t happen before you rise to that level of consciousness. That’s where your next level lives. On Day 3, you will go through the first 5 principles of the Energetic Selling Method™ and raise your consciousness to the level where your extraordinary growth exists. On this final day, you’ll dive into the process of selling - how to use the principles of the Energetic Selling Method™ to sell out your high-end offerings, scale your business to multiple six-figures and beyond and, quite simply, make a huge difference in your life and lives of your clients. Lenka Lutonska is the creator of the Energetic Selling Method™; an international speaker; a leading NLP Trainer and Master Coach; and a business and mindset strategist for women coaches and change-makers who desire to make an extraordinary impact on the world, and their lives with it. She trains world-class, accredited coaches and helps women to scale their businesses to multiple six figures and beyond. She lives near London, UK with her three boys, husband and bossy cat. IT`S TIME FOR ENERGETIC SELLING METHOD™ - BRING IT ON!